This book achieves a goal that was set 25 years ago when the HAM theory of human memory was published. This theory reflected one of a number of then-current efforts to create a theory of human cognition that met the twin goals of precision and complexity. Up until then the standard for precision had been the mathematical theories of the 1950s and 1960s. These theories took the form of precise models of specific experiments along with some informal, verbally-stated understanding of how they could be extended to new experiments. They seemed to fall far short of capturing the breadth and power of human cognition that was being demonstrated by the new experimental work in human cognition. The next 10 years saw two major efforts to address the problems of scope. In 1976, the ACT theory was first described and included a production rule system of procedural memory to complement HAM's declarative memory. This provided a computationally adequate system which was indeed capable of accounting for all sorts of cognition. In 1993, a new version of ACT--ACT-R--was published. This was an effort to summarize the theoretical progress made on skill acquisition in the intervening 10 years and to tune the subsymbolic level of ACT-R with the insights of the rational analysis of cognition. Although the appearance of generally-available, full-function code set off a series of events which was hardly planned, it resulted in this book. The catalyst for this was the emergence of a user community. Lebiere insisted that assembling a critical mass of users was essential to the ultimate success of the theory and that a physical gathering was the only way to achieve that goal. This resulted in the First Annual ACT-R Summer School and Workshop, held in 1994. In writing the book, the authors became seized by an aspiration that went beyond just describing the theory correctly. They decided to try to display what the theory could do by collecting together and describing some of its in-house applications. This book reflects decades of work in ACT-R accumulated by many researchers. The chapters are authored by the people that did that particular work. No doubt the reader will be impressed by the scope of the research and the quality of the individual work. Less apparent, but no less important, was the effort that everyone put into achieving the overall consistency and technical integrity of the book. This is the first work in cognitive science to precisely model such a wide range of phenomena with a single theory. "This is an important book for everyone interested in the simulation of human intelligent behavior. It puts forward a compelling theory that provides hope that unification in cognitive science is not lost, and it could rescue cognitive science from Kuhnian chaos." "Anderson and Lebiere's description of the ACT-R theory is definitely the most advanced path toward realizing Newell's dream of a unified theory of cognition within the areas of psychology and cognitive science. It will continue to stimulate important theoretical and empirical research." "…a clear, up-to-date presentation of one of the dominant theories in cognitive science. Anderson and his colleagues argue that there are basic (and identifiable) symbolic units of thought, both for declarative and procedural knowledge. Their theory accounts for data across an unusually wide variety of cognitive activities, and thus provides a strong challenge to other views that attempt to explain cognition without these units. In addition, the book provides pointers to the corresponding simulations available on the Web so that interested readers can get hands-on experience with the models. This is an important book for cognitive scientists wanting to keep up with the work on unified theories of cognition." "…Anderson raises the bar on what it means to theorize in cognitive science. The combination of clearly framed theoretical issues, empirical data, and runnable models make the inner workings of the ACT-R theory accessible to all serious cognitive researchers. 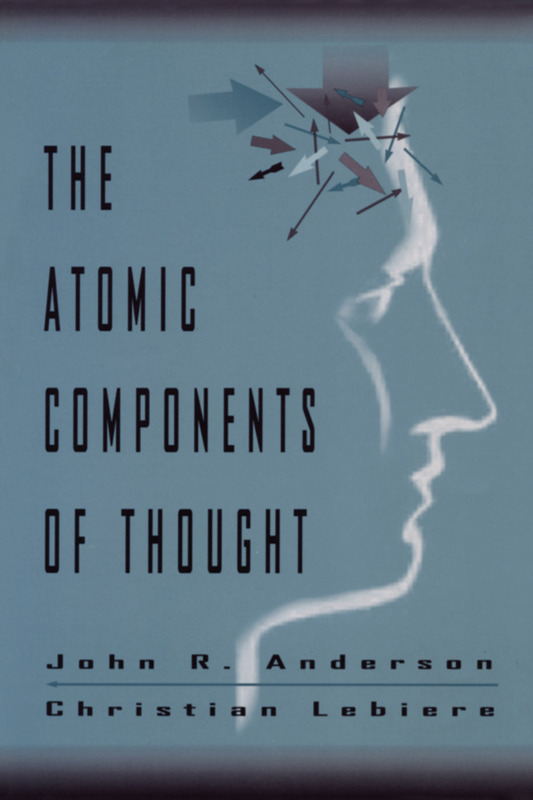 The Atomic Components of Thought brings ACT-R several steps closer to realizing Newell's dream of a unified theory of cognition. Also important, it will provide those students and researchers who have never modeled with a rich source of detailed and runnable examples. I predict that a major impact of this book will be an increase in the number of researchers and journals who consider a computational cognitive model as a standard accompaniment to any credible research report." "Anyone interested in cognitive architecture, or more broadly in the scientific study of mental processes, should read this book. It presents not only important progress in the development of a comprehensive and coherent account of a very broad range of cognitive phenomena, but also interesting ideas about how research in this area can be better organized to promote fruitful exchange of ideas." Contents: Preface. J.R. Anderson, C. Lebiere, Introduction. J.R. Anderson, C. Lebiere, Knowledge Representation. J.R. Anderson, C. Lebiere, M. Lovett, Performance. J.R. Anderson, C. Lebiere, Learning. J.R. Anderson, M. Matessa, C. Lebiere, Visual Interface. M.D. Byrne, J.R. Anderson, Perception and Action. J.R. Anderson, D. Bothell, C. Lebiere, M. Matessa, List Memory. M. Lovett, Choice. C. Lebiere, J.R. Anderson, Cognitive Arithmetic. D.D. Salvucci, J.R. Anderson, Analogy. C.D. Schunn, J.R. Anderson, Scientific Discovery. J.R. Anderson, C. Lebiere, Reflections.